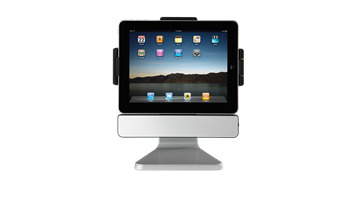 PadDock 10 is a unique stand for ipad. PadDock 10 features custom designed oval speakers, class D amplifier and a passive radiator for natural full sound. Integrated charge and sync mode allows switching to high speed charge mode without changing cable. PadDock 10 rotates 360 degrees for the best orientation and tilts for the best viewing angle. Overall Dimensions: 12.4" x 6.3" x 13"